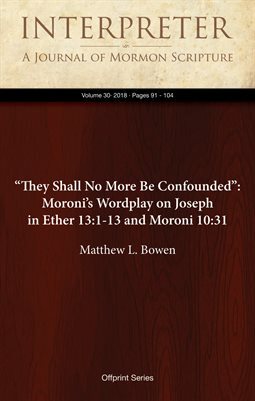 Abstract: In two related prophecies, Moroni employs an apparent wordplay on the name Joseph in terms of the Hebrew (lōʾ) yôsîp … ʿôd (+ verbal component), as preserved in the phrases “they shall no more be confounded” (Ether 13:8) and “that thou mayest no more be confounded” (Moroni 10:31). That phraseology enjoyed a long currency within Nephite prophecy (e.g., 1 Nephi 14:2, 15:20), ultimately having its source in Isaiah’s prophecies regarding Jerusalem/Zion (see, for example, Isaiah 51:22; 52:1– 2; 54:2–4). Ether and Moroni’s prophecy in Ether 13 that the Old Jerusalem and the New Jerusalem would “no more be confounded” further affirms the gathering of Israel in general and the gathering of the seed of Joseph in particular.